The sound of silence may not be what it seems, with white noise allowing us to enjoy the peace and tranquillity of natural environments in any location. If you've ever turned on a fan to enjoy a sleep-in or spent time camping next to a wandering creek, then you'll understand just how Zen white noise can be. While these analogue noise sources are still available, white noise apps are making it easier than ever before to tune out the world and enjoy the real sound of silence. White noise is the first thing we hear when we're born, with the sounds of the outside world filtered through our mother's body while we're in utero. White noise is also what you hear in a seashell, which also acts as a filter by eliminating certain frequencies and amplifying ambient noise through resonance. It turns out that silence is pretty much a myth and noise is all around us. Perhaps the best way ahead is to choose our personal level of exposure by listening to music or turning on a white noise app before we go to sleep. While it might seem counter-intuitive, listening to noise can be incredibly relaxing. 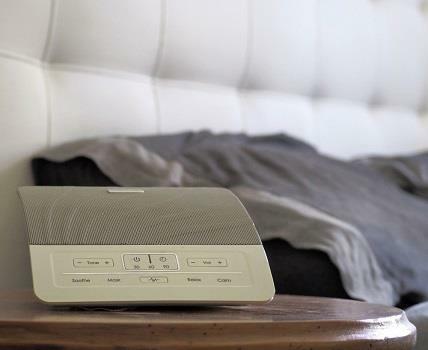 White noise has already helped millions of insomniacs to fall asleep, with a single constant low level noise source able to filter out abrasive and distracting noises from the environment. In order to understand how white noise can be so powerful, it's important to understand sleep and relaxation from an evolutionary perspective. According to Rafael Pelayo, a clinical professor of psychiatry and behavioural sciences at the Stanford Centre for Sleep Sciences and Medicine, our bodies still believe that sleep is inherently dangerous. Whether it's a physical threat, a baby screaming, or someone trying to steal our stuff, people have evolved to wake up quickly when they hear a surprising noise. In the modern urban world, however, this noise is more likely to be a rubbish truck, an overhead plane, or a drunk person stumbling down the street. While we'd all like to fall asleep next to the ocean, it turns out that everyone can benefit from white noise with little more than a smartphone on their bedside table. In fact, noise apps give us a much greater degree of control over the level and type of noise, with people able to choose between ocean noise, a waterfall, a distant crowded room, or even an air conditioning unit. As the world around us gets noisier and harder to control, a simple white noise app on your smartphone may be the secret to a good night's sleep.